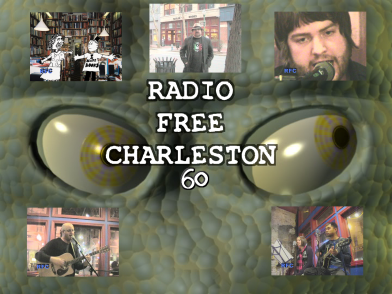 The 60th episode of Radio Free Charleston, our post-Valentine’s Day valentine to Taylor Books, is online now. (and is the bigg The music, host segments, and 60 Second Art Show were all recorded at Taylor Books and/or the Cafe and Annex Gallery. The music was recorded on consecutive nights in January, and the rest just last Monday evening. Our music this week is from Captain Crash and the Beauty Queen, Joseph Henry and John Radcliff. The “60 Second Art Show features a quick look at the work of Taylor Book’s Annex Gallery regulars Eric Pardue and Charles Jupiter Hamilton. Our animation this time is by the mystery man known as P-Dox. We recorded our host segments at Taylor’s on Monday evening, taking up the owner, Ann Saville, on her generous standiing offer to film there. Since we shot all three of our musical guests at Taylor’s last month, we figured we’d go all out and record the host segments there. Taylor Books is a true gem in the heart of downtown Charleston, and we felt it was time we paid our respects to one of the coolest places in West Virginia. Plus we added a 60 Second Art Show for good measure. The art show features the work of two old friends of mine, Charlie Hamilton and Eric Pardue. You can find an assortment of their work at the Annex Gallery at Taylor’s most of the time. A couple of quick corrections before we go on: First, I mis-pronounced Ann Saville’s name in the show. I knew better, but we shot the host segments in one take, and I was speaking so quietly that I didn’t realize I did it until I was editing the show. Sorry Ann. 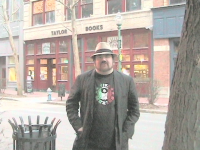 Second, I plug the Gazzcam at Taylor Books in the show. I didn’t know at the time that it was offline, possibly due to being bitten to death by radioactive squirrels. It may be some time before it gets repaired, but when it does, we’ll be sure to let you know. 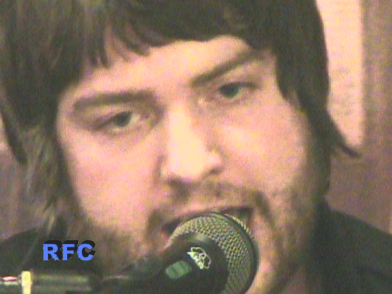 Captain Crash and The Beauty Queen, who first appeared way back on RFC’s 19th episode as “Aurora” are our first musical guest this week. You can see why they’re also known as RFC’s “Cutest couple.” That’s the kids at right, posing with some crazy-looking old guy at a Tofujitsu show last December. Jonathan is being deployed to Iraq in a few days with the National Guard, and we wanted to give him a good send-off on the show. Captain Crash and The Beauty Queen’s last show before he leaves is Friday night at Capitol Roasters at 7 PM. 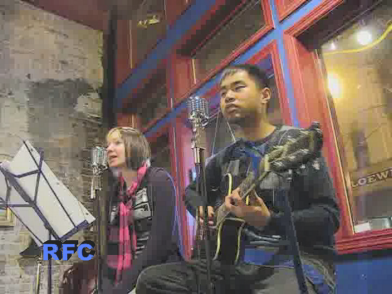 On the show, they perform their original song, “I’ve Gotta Say,” written by Jonathan about a former friend. The animation intro, this week, is by one of Mark Wolfe and Amy Williams’ Kreeture Comforts art plushes, which can be found at Taylors. The voice is courtesy of RFC Big Shot and Resident Diva, Melanie Larch. The animation itself is the work of P-Dox, a mystery man who used to contribute some rather controversial industrial noise music to the RFC radio show back in the day. People either loved it or hated it. His cartoon, “Bookstore,” is considerably shorter than his songs. Joseph Henry is a Parkersburg area singer-songwriter, who plays several instruments, but is seen here on keyboards. He has a heavily-Beatles-influenced style, with a mad-dash of Ben Folds and Queen thrown in for good measure. His lyrics, however, take things to a bizarre new level. After we caught his show at Taylors I told him it was like hearing Beatles music with DEVO lyrics. A match made in Heaven for me. We feature two songs by Joseph, all medly-ized for your convenience: “Work” and “Transportation Blues.” In addition to his solo shows, Joseph has also been performing as one of Todd Burge’s Odd Urges of late. 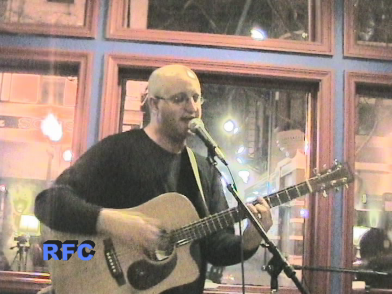 We recorded Joseph Henry and John Radcliff doing a double bill at Taylor’s on January 17. Left, you can see Joseph and Rad diplomatically pretending not to notice the loud purple blazer that the other guy in the photo was wearing. John Radcliff, who turned us on to Joseph, is no slouch in the singer-songwriter department himself. 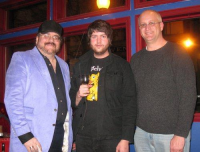 An amazing songwriter in the mold of Andy Partridge, Rad first came to notice as the guitarist for The Swivel Rockers back in the golden age of RFC radio. He also made his mark with The Feast Of Stephen (the RFC revival of which he spear-headed) and has been on the show many times over the past two years. He’ll be back next week with a full-fledged tune, but this time we hear him with Joseph Henry performing “Come On In And Stay Awhile” while we roll the end credits. Speaking of end credits, it just occurred to me that I left out the credit for camera operators. The aforementioned Melanie Larch ran camera for the host segments and ran one camera for Joseph Henry and John Radcliff. I ran two cameras for Joseph and Rad, and all three for Captain Crash and The Beauty Queen. I also shot the 60 Second Art Show. Editing, as usual, was by yours truly. Credit where credit is due, don’cha know. That’s the dirt behind RFC 60. Next week come back for more from John Radcliff, as well as the long-awaited and much-requested RFC debut of SHINDIG, recorded at the La Belle Theater in just last Friday, as I write this. The coming weeks will see music from Tofujitsu, A Place Of Solace, Flare Baroshi, Whistlepunk, Electro Biscuit, The Concept, The ButtonFlies, Spurgie Hankins Band and more. Just keep reading PopCult for all the details. Juan Radcliff, who turned Jose to us, is not slouch in the department of the same singer-composer. An amazing composer in the mold of the partridge of Andres, Rad first wine to behind notice like the guitarist for the axes of balance beam of the revolving link at the time sea bream of the radio of the RFC. He also made his mark with the banquet of Stephen (the Renaissance of the RFC whose he headed) and has been in the demonstration often during last the two years. It will be behind the next week with a done and right harmony, but this time that we inside heard with the execution of advanced Joseph Henry “and which we remain awhile” whereas we rolled the credits of the end. Speaking of credits of the end, he finishes happening that I left outside towards the credit for the operators of the camera. The larch already mentioned of Melanie worked the camera for the segments of the host and worked a camera for Joseph Henry and Juan Radcliff. I worked two cameras for Jose and the Rad, and the three for captain Crash and the queen of beauty. It hardly keeps reading of PopCult for all the details.